Kawasaki KZ200 as a 200 cc bike has a lot of options to be modified . One of the most favored by the owners of this bike is to turn it into a chopper . 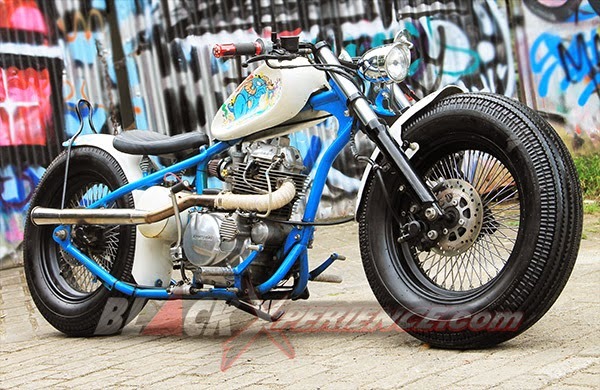 As performed by Axunx , owner 1983 Kawasaki KZ200 make this bike into Heiwa Custom style . That is one of Japan's modification workshops . Japanese feel taste of the framework that adheres to the model order of the samurai . All proceeds custom -made builder. Then the characteristic appears next to the tank . Small form with a concave surface on the side next to strengthen the impression Heiwa . In the tank well covered with cartoon images of dogs and goats intangible which is the owner of the zodiac and Shio . The composition of blue and white in order to make the appearance of the body enough Binter Heiwa be looks " cute " . Lead to further characterize the motorcycles electrical component box . Builder makes the bottom of the seat tube to secure all electrical devices . Great legs is certain to be a part of this one custom motorcycles . 16x34.5 -inch wheels stuffed in the legs and paired with Shinko tires on both wheels measuring 500-16 . The front suspension has been retired , so that more matching Shockbreaker then adopted a Yamaha Byson. Shockbreaker back together with the rigid frame to the seat directly prop. For more pictures and information you can go to this site. 3 Tanggapan untuk "Kawasaki KZ200 Chopper Modification - MMC Outsider Jakarta"
hi everyone, I've recently got a 78 Kawasaki z200 for my first bike only problem is the people before me striped some essentials off the bike that I need to get back on and pilot air adjust and air adjust screws before it will be street ready. Any suggestions on looking for the right parts?